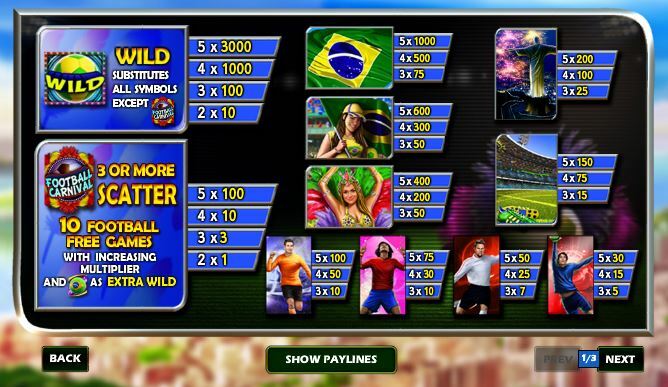 Coming from Playtech, Football Carnival is a modern slot machine which was dedicated to the Brazilian based World Cup of 2014. The graphics are as good as you would expect them to be, seeing as this is a modern title and not something from a decade ago. They did right by their players with the features as well, the stacked symbols being a lot of fun when they manage to form their combinations. 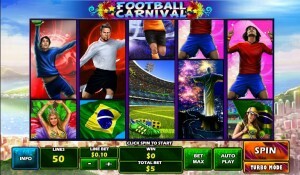 Football is the world’s most popular sport, and it shows in the sheer number of slot machines which are available with this theme. Players that love football and want to give this slot a chance will find that it has 5 reels with 50 active lines on them at all times. 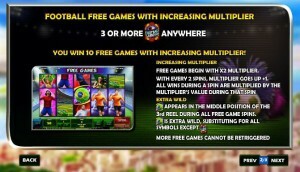 There are stacked symbols present, free spins, increasing multipliers and wilds. Top payouts will put up to $75,000 in your pocket. The game has more than half of its symbols of the stacked variety, plus there are wild symbols in it, scatters and free spins which have increasing multipliers. 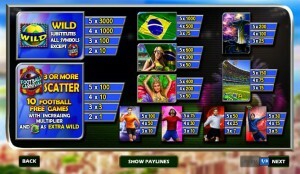 The Wild Football is the symbol that you can count on to offer you the slot’s best prizes, though they only go up to 3,000x. This symbol often appears on its own, but from time to time you can expect it to offer prizes directly as well. Whenever it appears, the wild is capable of helping you form new combinations by substituting for a symbol that you’re missing. It’s not an all powerful feature, so it can only help out in certain conditions, when it lands exactly where it’s needed and when all the other requirements of a combo are met (a minimum of three symbols arranged on the same line and from the left to the right). The Football Carnival Logo is used by the game as the scatter, the one symbol that isn’t constrained by the game’s paylines, forming its combinations from whatever random positions it lands on. You get paid with just two scattered Logos, but that only brings you the equivalent of the triggering bet. With all five Logos present, the prize goes up to 100x the bet. Besides prizes, the scattered Logos also offer you free spins. 3+ Logos will trigger 10 free games and for the duration of this feature you will have extra wild symbols and an increasing multiplier. You start the spins with the 2x multiplier. 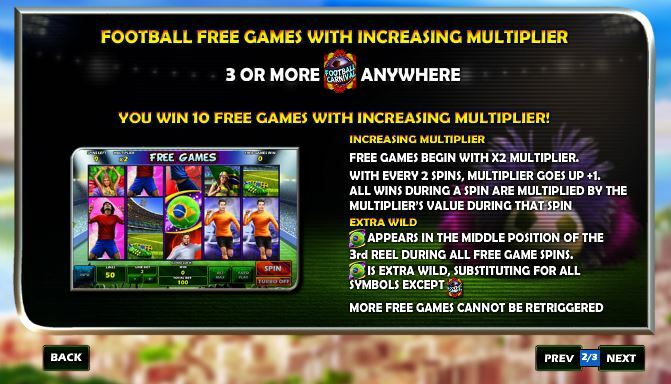 For every 2 spins that you go through, the multiplier goes up by 1x. As for the extra wild, this new symbol appears in the middle position on the 3rd reel. This is another part of the game that I enjoyed. Six of the symbols available in this slot are stacked, but they occupy only two spots on the reel. These are regular symbols and they offer prizes when forming combinations of 3 to 5. The game uses 50 lines and doesn’t give you the option to select only some of them. They’re all active and you use 50 coins each round. The line bet varies wildly, between $0.01 and $25, so you can spend as much as $1,250 each round. You can get up to $75,000 from a single combo, when five wilds team up on the same line. However, there is also the scatter symbol and its 100x prize, which offers you up to $125,000. The game’s design is worthy of the spectacle that a World Cup event gives you. Rio de Janeiro is visible behind the reels, while on them you have high quality pictures of footballers, fans and other related images. 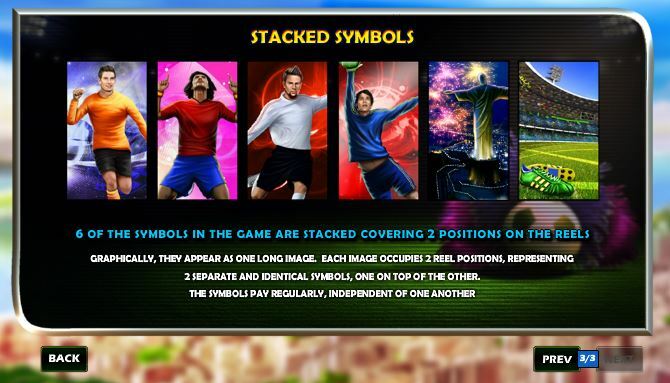 The presence of the six stacked symbols gives the game a look that is different from that of its competitors. Symbols: Football (3,000 coins, wild), Football Carnival Logo (scatter, 100x the bet), Flag (1,000 coins), Fan Girl (600 coins), Carnival Dancer (400 coins), Jesus Statue (200 coins), Stadium (150 coins), Black & Orange Player (100 coins), Red Player (75 coins), White and Black Player (50 coins) and Blue Goalkeeper (30 coins). It’s an excellent game, with a beautiful design and with some very interesting features, especially when the free spins and the increasing multipliers get involved. You will find Football Carnival at any online casino which chooses to use software from Playtech, playable either for free or for real money.